Location of Edmonton within census division number 11, Alberta, Canada. Edmonton is the capital of the Canadian province of Alberta, and its second largest city. It is the northernmost North American city with a metropolitan population over one million. Edmonton is Canada's second most populous provincial capital (after Toronto) and is a cultural, government and educational center. It plays host to a year round slate of world-class festivals, earning it the title of "The Festival City." Edmonton also serves as a staging point for large-scale oilsands projects occurring in northern Alberta and large-scale diamond mining operations in the Northwest Territories. It is additionally home to North America's largest mall and Canada's largest historic park. It is situated in the central region of the province, an area with some of the most fertile farmland on the prairies. At 684 square kilometres (264 sq mi), the City of Edmonton covers an area larger than Chicago, Philadelphia, or Toronto. Edmonton has one of the lowest population densities in North America, about 9.4 percent that of New York City. The earliest human inhabitants in the area now called Edmonton can be dated back to approximately 10,000 BCE, when an ice-free corridor opened up as the last ice age ended and timber, water and wildlife became available in the region. In 1754, Anthony Henday, an explorer working for the Hudson's Bay Company, may have been the first European to enter the Edmonton area. His expeditions across the Canadian Prairies were mainly to seek contact with the aboriginal population for the purpose of establishing fur trade, as competition was fierce between the Hudson's Bay Company and the North West Company. By 1795, Fort Edmonton was established as a major trading post for the Hudson's Bay Company. It was named after the English hometown, now a part of Greater London, of the HBC deputy governor Sir James Winter Lake. In the late nineteenth century, the highly fertile soils surrounding Edmonton helped attract settlers, further establishing Edmonton as a major regional commercial and agricultural centre. Edmonton was also a major stopping point for people hoping to cash in on the Klondike Gold Rush in 1897. During the early 1910s, Edmonton grew very rapidly due to rising speculation in real estate prices. In 1912, Edmonton amalgamated with the city of Strathcona south of the North Saskatchewan River. As a result, the city extended south of the river. Just prior to World War I, the real estate boom ended abruptly, causing the city's population to drop sharply from over 72,500 in 1914 to under 54,000 only two years later. Recruitment to the Canadian military during the war also contributed to the drop in population. Afterwards, the city was slow to recover in population and economy during the 1920s and 1930s, until World War II. The first licensed airfield in Canada, Blatchford Field (now Edmonton City Centre Airport) opened in 1929. Pioneering aviators such as Wop May and Max Ward used Blatchford Field as a major base for the distribution of mail, food and medical supplies to the Canadian North. Hence Edmonton's role as the "Gateway to the North" was strengthened. World War II saw Edmonton becoming a major base for the construction of the Alaska Highway and the Northwest Staging Route. The first major oil discovery in Alberta was made on February 13, 1947 near the town of Leduc to the south of Edmonton. Oil reserves were known as early as 1914 to exist in the southern parts of Alberta but they produced very little oil compared to those around Edmonton. Additional oil reserves were discovered during the late 1940s and the 1950s near the town of Redwater. Since most of Alberta's oil reserves were concentrated in central and northern Alberta, Edmonton became home to most of Alberta's oil industry. The subsequent oil boom gave Edmonton new status as the Oil Capital of Canada. During the 1950s, the city increased in population from 149,000 to 269,000. After a relatively calm but still prosperous period in the 1960s, the city's growth took on renewed vigour with high world oil prices, triggered by the 1973 oil crisis and the 1979 Iranian Revolution. The oil boom of the 1970s and 1980s ended abruptly with the sharp decline in oil prices on the international market and introduction of the National Energy Program in 1981. The population had reached 521,000 that same year. Although the National Energy Program was later scrapped by the federal government in the mid-1980s, the collapse of world oil prices in 1986 and massive government cutbacks kept the city from making a full economic recovery until the late 1990s. In 1981, West Edmonton Mall, which was at the time the world's largest mall, opened. Still the biggest in North America, the mall is Alberta's most-visited tourist attraction, and contains an indoor amusement park, a large indoor waterpark, a skating rink, a New Orleans-themed bar district and a luxury hotel in addition to over eight hundred shops and services. On July 31, 1987, a devastating tornado, ranked as an F4 on the Fujita scale, hit the city and killed twenty-seven people. The storm blew rail cars off a bridge crossing the North Saskatchewan River and hit the areas of Beaumont, Mill Woods, Bannerman, Fraser, and the Evergreen Trailer Park. Then-mayor Laurence Decore cited the community's response to the tornado as evidence that Edmonton was a "city of champions," which later became the city's slogan. The city entered its current period of economic recovery and prosperity by the late 1990s, helped by a strong recovery in oil prices and further economic diversification. While oil production and refining remains the basis of many jobs in Edmonton, the city's economy has managed to diversify significantly. The downtown core and parts of the inner city, after years of extremely high office vacancy rates and neglect, have recovered to a great degree. It is still undergoing a renaissance of its own, with further new projects underway, and more people choosing to live in or near the downtown core. This economic prosperity is bringing in large numbers of workers from around Canada. 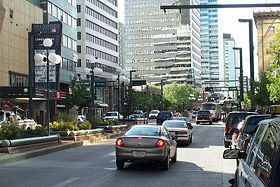 Downtown Edmonton has undergone a continual process of renewal and unprecedented growth since the mid 1990s. Many buildings were demolished during the oil boom starting in the 1960s and continuing into the 1980s to make way for office towers. Edmonton is located near the geographical centre of the province at an elevation of 668 metres (2,192 ft). The North Saskatchewan River bisects this city and originates at the Columbia Icefield in Jasper National Park. It empties, via the Saskatchewan River, in Lake Winnipeg, and the Nelson River, into Hudson Bay. It runs from the southwest to the northeast through the city and is fed by numerous creeks throughout the city, such as Mill Creek and Whitemud Creek. This creates numerous ravines, many of which have been incorporated into the urban parkland. Edmonton is situated at the boundary between prairie to the south and boreal forest to the north, in a transitional area known as aspen parkland. However, the aspen parkland in and around Edmonton has long since been heavily altered by farming and other human activities, such as oil and natural gas exploration. 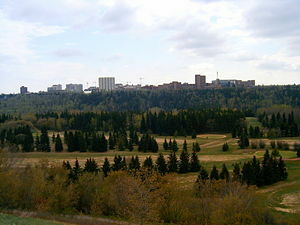 Edmonton's river valley constitutes the longest stretch of connected urban parkland in North America, and Edmonton has the highest per capita area of parkland of any Canadian city. The river valley is also 22 times larger than New York City's Central Park. The public river valley parks provide a unique urban escape area with park styles ranging from fully serviced urban parks to campsite-like facilities with few amenities. This main 'Ribbon of Green' is supplemented by numerous neighborhood parks located throughout the city, to give a total of 111 square kilometres (27,400 acres) of parkland. Within the 7,400 hectare (18,000 acre), 25 kilometre (15.5 mi) long river valley park system there are 11 lakes, 14 ravines, and 22 major parks. Most of the city has excellent bike and walking trail connections. Edmonton's streets and parklands are also home to one of the largest remaining concentrations of healthy American Elm trees in the world, unaffected by Dutch Elm disease, which has wiped out vast numbers of such trees in eastern North America. Jack Pine, Lodgepole Pine, White Spruce, White Birch, Aspen, Green Ash, Basswood, various poplars and willows, and Manitoba Maple are also abundant; Bur Oak is increasingly popular. Introduced tree species include Blue Spruce, Norway Maple, Red Oak, Sugar Maple, Common Horse-chestnut, McIntosh Apple, and Evans Cherry. Three walnut species—Butternut, Manchurian Walnut and Black Walnut—have survived in Edmonton. Cross-country skiing and ice skating are popular during the long winter. Four downhill ski slopes are located in the river valley as well, two within the city and two immediately outside. Edmonton has a northern continental climate with extreme seasonal temperatures, although the city has milder winters than either Regina or Winnipeg, which are both located at a more southerly latitude. It has mild summers and chilly winters, with the average daily temperatures ranging from -11.7°C (10.9°F) in January to 17.5°C (63.5°F) in July. Annually, temperatures exceed 30°C (86°F) on an average of three days and fall below −20°C (−4°F) on an average of twenty-eight days. The highest temperature recorded in Edmonton was 37.6°C (99.7°F) on July 2, 1924. Some areas, however, such as the City of St Albert and Sherwood Park recorded temperatures of 37.7°C (99.9°F) on July 22, 2006, while the downtown core managed to reach around 35°C (95°F). The coldest temperature was −49.4°C (−56.9°F), recorded on January 19 and 21, 1886. 2006 was a particularly warm year for Edmonton, as temperatures reached 29°C (84.2°F) or higher more than twenty times during the year, from as early as Mid-May and again in early September. Typically, summer lasts from late June until late August, and the humidity is rarely uncomfortable. Winter lasts from November through March and varies greatly in length and severity. Spring and autumn are both short and highly variable. Edmonton has a dry climate. On average, Edmonton receives 476 mm (18.78 in) of precipitation and 123.5 cm (48.6 in) of snowfall per annum. The wettest month is July, while the driest months are October and November. In July, the mean precipitation is 92 mm (3.6 in). Extremes do occur such as the 114 mm of rainfall that fell on July 31, 1953. Summer thunderstorms can be frequent and sometimes severe enough to produce large hail, damaging winds, funnel clouds and even tornadoes. However, tornadoes near Edmonton are far weaker and short-lived compared to their counterparts farther south. Tornadoes as powerful as the F4 tornado which struck Edmonton on July 31, 1987, killing 28, are very rare. Edmonton has also been known to have other forms of severe weather, including a massive storm with both rain and hail which occurred on July 11, 2004. Although these occur infrequently, this "1-in-200 year event" flooded major intersections and underpasses as well as damaging both residential and commercial properties. Most notably, the storm caused extensive damage to West Edmonton Mall, as water accumulated on the roof. The roof collapsed under the weight and water drained onto the mall's indoor ice rink. Edmonton is the most northerly major city in North America with a metro population of over one million. It is at the same latitude as Hamburg, Germany and Liverpool, England. At the summer solstice, Edmonton receives seventeen hours and six minutes of daylight, with twilight extending well beyond that. Edmonton receives 2,289 hours of sunshine per year, and is one of Canada's sunniest cities. Edmonton is the major economic center for northern and central Alberta and a major centre for the oil and gas industry. It has traditionally been a hub for Albertan petrochemical industries, earning it the nickname "Oil Capital of Canada" in the 1940s. Supply and service industries drive the energy extraction engine while research develops new technologies and supports expanded value-added processing of Alberta's massive oil, gas and oil sands reserves. These are reported to be the second largest in the world after Saudi Arabia. Despite the apparent focus on oil and gas, Edmonton's economy is now the second most diverse in Canada. Major industrial sectors include a strong technology sector and associated biotech sector. During the 1980s, Edmonton started to become a major financial center with both regional offices of Canada's major banks and locally based institutions opening. However, the turmoil of the late 1980s economy radically changed the situation. Locally based operations would fail and regional offices were moved to Calgary. The 1990s saw a solidification of the economy and now Edmonton is home of Canadian Western Bank, the only publicly traded Schedule I chartered bank headquarters west of Toronto. According to the mid-2006 census, there were 730,372 residents within the city of Edmonton proper, compared to 3,290,350 for all of Alberta. The total population of the CMA (Census Metropolitan Area) was 1,034,945. In the five years between 2001 and 2006, the population of the city of Edmonton proper grew by 9.6 percent, compared with an increase of 10.4 percent for Edmonton CMA, and 10.6 percent for Alberta as a whole. The population density of the city of Edmonton proper averaged 1,067.2 people per square kilometre (2,764/sq mi), compared with an average of 5.1 people per square kilometre (13.2/sq mi), for Alberta altogether. In mid-2001, 11.7 percent of Edmonton's population were of retirement age (65 and over for males and females) compared with 13.2 percent in Canada. The median age is 35.3 years of age compared to 37.6 years of age for all of Canada. Children under five accounted for approximately 5.8 percent of the resident population of Edmonton. This compares with 6.2 percent in Alberta, and almost 5.6 percent for Canada overall. According to the 2006 census, the five biggest minorities in Edmonton were Chinese 7.5 percent, Aboriginal 4.8 percent, South Asian 4.5 percent, Black 4.1 percent, and Filipino at 2.3 percent. Edmonton is a major transportation gateway to northern Alberta and northern Canada. There are two airports in the city, of which Edmonton International Airport is the largest, flying passengers to destinations in the United States, Europe, Mexico, and the Caribbean, along with charters to Japan. Interurban passenger rail service is operated by VIA Rail to Jasper National Park, Saskatchewan, and British Columbia. Edmonton serves as a major transportation hub for CN Rail, whose North American operation centre is located at their Edmonton offices. With direct air distances from Edmonton to places such as New Dehli in Asia and London in Europe being shorter than to other main airports in Western North America, Edmonton Airports is working to establish a major container shipping hub called Port Alberta. A largely gridded street system forms most of Edmonton's street and road network. The address system is mostly numbered, with streets running south to north and avenues running east to west. In built-up areas built since the 1950s, local streets and major roadways generally do not conform to the grid system. Major roadways include Yellowhead Trail and Whitemud Drive, and the city is connected to other communities elsewhere in Alberta, B.C., and Saskatchewan via the Yellowhead Highway to the west and east, and the Queen Elizabeth II Highway to the south. The Edmonton Transit System is the city's main public transit agency, operating a light rail transit (LRT) line as well as a large fleet of buses and trolley buses. Scheduled LRT began on April 23, 1978, with five extensions of the single line completed since. The original Edmonton line is considered to be the first "modern" Light Rail line in North America (i.e., built from scratch, rather than being an upgrade of an old system). It introduced the use of German-designed rolling stock that subsequently became the standard light rail vehicle of the United States. The Edmonton "proof of payment" fare collection system adopted in 1980—modelled after European ticket systems—became the North American transit industry's preferred approach for subsequent light rail projects. Edmonton's first power company established itself in 1891 and installed street lights along the city's main avenue, Jasper Avenue. The power company was bought by the Town of Edmonton in 1902 and remains under municipal ownership today as EPCOR. Also in charge of water treatment, in 2002, EPCOR installed the world's largest ultraviolet (UV) water treatment or Ultraviolet disinfection system at its E.L. Smith Water Treatment Plant. There are four main hospitals serving Edmonton: The University of Alberta hospital, The Royal Alexandra Hospital, The Misercordia Hospital and The Grey Nuns Hospital. Other area hospitals include the Sturgeon Community Hospital in St. Albert, the Leduc Community Hospital in Leduc, the Westview Health Centre in Stony Plain, and the Fort Saskatchewan Health Centre in Fort Saskatchewan. All hospitals are under the administration of the Capital Health Authority although the Misercordia and the Grey Nuns are run separately by the Caritas Health Group. Edmonton is at the centre of a metropolitan area that includes thirty-five independent municipalities either adjacent to Edmonton's city limits or within several kilometres of it. 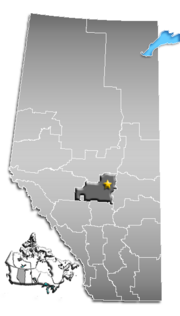 Larger communities include Sherwood Park (part of the Specialized Municipality of Strathcona County), St. Albert, Fort Saskatchewan, Leduc, Nisku (major industrial area in Leduc County), and the towns of Beaumont, Devon and Morinville. This large scale fragmentation has played a role in the development of the Edmonton region. Although several attempts have been made by the City of Edmonton to annex surrounding municipalities, no amalgamation has of yet been approved by the provincial government since Edmonton absorbed the town of Beverly in 1961. The University of Alberta's main campus near the North Saskatchewan River valley. The University of Alberta (known colloquially as the "U of A"), whose main campus is situated on the south side of Edmonton's river valley, is a board-governed, public institution with annual revenue of one billion dollars. 35,000 students are served in more than 200 undergraduate programs and 170 graduate programs. Main campus consists of more than 90 buildings on 890,000 square metres (220 acres) of land, with buildings dating back to the university's establishment in 1908. It is also home to Canada's second largest research library which ranks first in volumes per student with over 10 million (in 2005) and subscriptions to 13,000 full-text electronic journals and 500 electronic databases. The University of Alberta has been recognized on several fronts internationally. Edmonton has three publicly funded school boards, who provide kindergarten and grades one through twelve. The vast majority of students attend schools in the two large English language boards: Edmonton Public Schools and the separate Edmonton Catholic School District. Since 1994, the francophone minority community has had their own school board based in Edmonton, the North-Central Francophone School Authority, which includes surrounding communities. Most recently the city has seen a small number of public charter schools open, independent of any board. All three school boards and public charter schools are funded through provincial grants and property taxes. Some private schools exist as well. Included are the Edmonton Academy and Tempo School. The Edmonton Society for Christian Education used to be a private school, however they became part of Edmonton Public Schools. Both the Edmonton Public Schools and the Edmonton Catholic School District also provide support and resources for those wishing to home school their children. The Francis Winspear Centre for Music. Edmonton has always been a city proud of its cultural accomplishments. As the city has grown, so has the cultural scene. Today, Edmonton is a proud home to many features which add to its cosmopolitan flair. Many events are anchored in the downtown Arts District, centred around the newly renovated Churchill Square (named in honor of Sir Winston Churchill). The Francis Winspear Centre for Music was opened in 1997 after years of planning and fundraising. Described as one of the most acoustically perfect concert halls in Canada, it is home to the Edmonton Symphony Orchestra and hosts a wide variety of shows every year. It seats 1,916 patrons and houses the $3 million Davis Concert Organ, the largest concert organ in Canada. An interesting aspect of the hall's design is its separation into acoustically separate areas each of which are insulated from each other through acoustical barriers built into the structure. Patrons and artists can see these in the form of double-door "sound locks." Across 102nd Avenue is the Citadel Theatre, so named after the Salvation Army Citadel in which Joe Shoctor first started the Citadel Theatre company in 1965. It is now one of the largest theatre complexes in Canada with five halls each specializing in different kinds of productions. For instance, the Maclab Theatre features a thrust stage surrounded by a U-shaped seating arrangement, while the Shoctor Theatre is a traditional stage setup. On the University of Alberta grounds is the 2534-seat Northern Alberta Jubilee Auditorium, which recently reopened after being out of commission for a year during heavy renovations carried out as part of the province's centennial celebrations. Both it and its southern twin in Calgary were constructed in 1955 for the province's silver jubilee and have played host to many concerts, musicals, and ballets. The Edmonton Opera uses the Jubilee as its base of operations. On the front of the building is a quote from Suetonius' Life of Augustus: "He found a city built of brick - left it built of marble." Old Strathcona is home to the Theatre District, which holds the Transalta Arts Barns (headquarters of the Edmonton International Fringe Festival), The Walterdale Playhouse, Catalyst Theatre, and the Varscona Theatre (base of operations for several theatre companies, including Teatro la Quindicina, Shadow Theatre, Rapid Fire Theatre, Die-Nasty, and Oh Susanna!). There are also over seventy museums in Edmonton of ranging sizes. The largest is the Royal Alberta Museum (formerly the Provincial Museum of Alberta until renamed by Queen Elizabeth II during her 2005 visit) which houses over 10 million objects in its collection. The main building, located on the river valley west of downtown in Glenora, was opened in 1967 and is now in the early stages of large-scale redevelopment. The Art Gallery of Alberta is the city's largest single gallery. Housed in an inconspicuous production of 1970s architecture, the AGA collection has over 5,000 pieces of art. Fundraising is currently underway for a new building designed by Randall Stout. Independent galleries can be found throughout the city, especially along the 124th Street corridor. 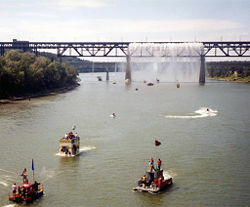 2001 Sourdough Raft Race, passing beneath the High Level Bridge's Great Divide waterfall during Klondike Days. Edmonton plays host to several large festivals each year, hence its local nickname as "The Festival City." Downtown Edmonton and Churchill Square host numerous festivals each summer. The Works Art & Design Festival, which takes place from late June to early July, showcases Canadian and international art and design from well-know, award-winning artists, as well as emerging and student artists. The Edmonton International Street Performer's Festival takes place in mid-July and showcases street performance artists from around the world. Edmonton's main summer festival is "Capital EX" (formerly Klondike Days.) Klondike Days (or K-Days) was originally an annual fair and exhibition which eventually adopted a gold rush theme. In early 2006, it was decided that the festival would be renamed "The Capital City Exhibition" ("Capital EX"). Activities include chuckwagon races, carnival rides and fairways, music, trade shows and daily fireworks. Since 1960, the Sourdough Raft Races have also been a popular event. Later in November Edmonton plays host to the Canadian Finals Rodeo and Farmfair. This is a significant event in Canada's rodeo circuit and second only to the National Finals Rodeo in Las Vegas in prestige. The Edmonton International Fringe Festival, which takes place in mid-August, is the largest Fringe Theatre Festival in North America, and second only to the Edinburgh Fringe festival in the world. In August, Edmonton is also host to the Edmonton Folk Music Festival, one of the most successful and popular folk music festivals in North America. Another major summer festival is the Heritage Days Festival which is an ethnocultural festival that takes place in Hawrelak Park on the Heritage Day long weekend. Many other festivals occur such as the River City Shakespeare Festival, the Dragon Boat Festival and the Edmonton International Film Festival. Edmonton has a proud heritage of very successful sports teams including numerous professional, minor-league, and University-level sports teams. Additionally, Edmonton hosted the 1978 Commonwealth Games, the 1983 World University Games (Universiade), the 2001 World Championships in Athletics, and the 2005 World Master Games. In 2006, it played host to the Women's Rugby World Cup. In the summer of 2007, Edmonton will host the Under 20 Fifa World Cup which is the third largest sporting event in the world. Edmonton has a circuit on the Champ Car World Series known as the West Edmonton Mall Grand Prix Presented by The Brick Champ Car series. This event is the best attended event in the series. The archbishop responsible for Roman Catholic institutions in central Alberta between the Saskatchewan and British Columbia borders. The archbishop responsible for Ukrainian Catholic Church in Alberta. The archbishop responsible for Ukrainian Orthodox Church of Canada in all of Western Canada. The bishop responsible for Eastern Rite Orthodox Churches in North America. The bishop responsible for Anglican institutions in central Alberta between the Saskatchewan and British Columbia borders. The first mosque established in North America in 1938, the Al-Rashid Mosque founded by Abdullah Yusuf Ali, is situated in Edmonton. The Edmonton Alberta Temple of the Church of Jesus Christ of Latter-day Saints was dedicated on Dec. 11, 1999. ↑ "Defending 'Deadmonton' from British blitz", BBC News, August 9, 2001. Retrieved August 2, 2011. ↑ Kaufmann, Bill (August 1, 2011). Economy to blame for 'Deadmonton' bloodshed?. Sun News Network. Retrieved August 2, 2011. ↑ Alberta Municipal Affairs (2010-09-17). Municipal Profile – City of Edmonton. Retrieved April 17, 2012. ↑ 4.0 4.1 Population and dwelling counts, for census metropolitan areas, 2011 and 2006 censuses. Statistics Canada (2012-02-08). Retrieved April 17, 2012. ↑ Population and dwelling counts, for Canada, provinces and territories, and population centres, 2011 and 2006 censuses (Alberta). Statistics Canada (2012-02-08). Retrieved April 17, 2012. ↑ Edmonton Market Profile. Omaccanada.ca. Retrieved April 17, 2012. ↑ Resourceful. Responsible.gov of Alberta. ↑ Statistics Canada. 2001 Census- Religion by population in Edmonton. Retrieved 2007-01-20. ↑ The Works Art & Design Festival,theworks. ↑ Edmonton International Street Performer's Festival edmonstonstreetfest.com. ↑ Finals Rodeo. Retrieved November 19, 2008. ↑ Edmonton Folk Music Festival. ↑ Catholic Archdiocese of Edmonton.edmondtoncatholic-church.com. ↑ Eastern Rite Orthodox Church orthodoxchurchofcanada. ↑ Anglican Diocese of Edmonton,.edmonton.anglican.org. This page was last modified on 25 September 2017, at 19:47.